Tonight on CBS Hawaii Five-O returns with an all new Friday September 26, season 5 premiere called, “A’ohe Kahi e Pe’e Ai.” On tonight’s episode the team searches O’ahu for a terrorist who is using weaponized drones on civilians. For those of you who don’t know, Hawaii Five-0 is an American police procedural drama television series and a remake of the original 1968–80 television series. On tonight’s episode the island of O’ahu goes on lockdown when Five-0 hunts a terrorist who starts using weaponized drones on civilians. Meanwhile, McGarrett and Danno must go for a mandated review with a psychologist, resulting in a session which looks a lot like couples therapy. This is definitely one series that you don’t want to miss. Don’t forget to stay tuned to Celeb Dirty Laundry where we will be live blogging every episode of Hawaii Five-O new season. On the picturesque island of Oahu, all doesn’t appear to be well. In fact for a popular island it’s looking surprisingly abandoned. 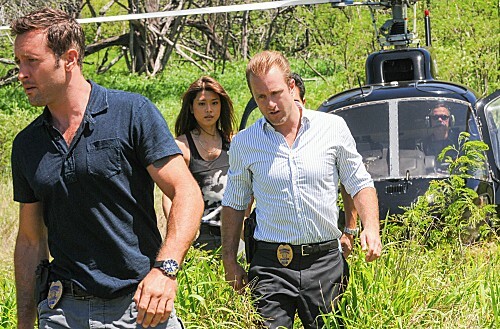 Rewind to seven hours earlier, Steve and Danno were in the middle of a forced counseling session. The whole thing was part of their mandated review and yet neither of them really wanted to participate in what felt like couple’s therapy. Though eventually they got over their uncomfortableness and did what had to be done. It seems all they needed was to remember the good times and they stopped arguing long enough to finish review. Which was good timing on their part. A case showed up on their radar and it looks suspicious. A young couple was out hiking when they were suddenly killed by a machine gun of some sorts. The machine gun ended up actually being a drone. Drones are commonly used in combat so to find proof of one so close to the mainland is worrisome. Meanwhile in Chinatown, Jerry was carry out a surveillance operation when Danno and Steve interrupted him. They wanted his help in identifying the drone their victims’ were able to catch on their phone. And their favorite conspiracy theorist managed to help them. The drone apparently was military issued. Officials say it was on a routine surveillance mission (that’s honestly why it was built) when someone hacked into it and took complete control. Not only did this mysterious person lock the military out, but they also refitted it into being used a weapon. So that nice couple that was attacked aren’t going to be the last victims. A second assault by the drone led to five dead and nineteen wounded. According to Jerry, there is a way to take down the drone. He can hack into and shut out its current controller. However to do so he would have to be in close proximity to the drone. So the team hands are tied. They can’t really do anything until there’s another attack. All they can do is ensure the safety of the inhabitants on the island by putting everything on lockdown. Their culprit reached out them but he doesn’t want to negotiate his terms which at first looked like mindless killing and frightening people. Their killer, Redmond, tried to say he was doing all of this because Americans had forgotten what terrorism was like. They were sitting safely at home without a care in the world when all the while they sent drones into villages to do all their dirty work. Redmond made himself out to be an idealistic sociopath. Yet a little digging into his past was able to prove that he was doing all of this for money. SRS, an international terrorist cell made up of former KGB officers had made him an offer of half a million dollars. And they did that in order to use him clear out the city. It seems they wanted to reach a man that was secretly selling them state’s secrets. Their man on the inside couldn’t make a run for it and they only way they collect him was to illegally land their plane right on the man road. The team figured out the plan in time and from there they were able to stop the terrorist cell from enacting their plan. Jerry stopped the drone and used it to crash into the plane. Then the rest was just running after fleeing terrorist and that at least was on foot. Steve got a bullet to the thigh but otherwise no one was injured. And Kono even found herself engaged after everything was said and done. Though trouble awaits all of them! Jerry wounded on someone’s hit list, Chin was still being investigated by the IA, and Danno’s brother might have wrote a check that Danno can’t cash!